The city of Salzburg is situated by the river Salzach, a river that runs across the entire province in a bended curve and shapes the landscape of it. The Salzach is 225 kilometres long and one of the most important rivers of the Austrian Alps. By international visitors, it is often incorrectly referred to as "Salzburg River". This is probably due to the similarity in the names. In fact, "Salz" means salt and "Ache" is an old German term for a river. The name therefore refers to the importance that the Salzach had as a transportation route for salt from Hallein and other mining places of the province up to the late 18th century. The "Salzburg River" originates in the Kitzbüheler Alpen in Tyrol, close to the border to Salzburg; it enters the River Inn at Passau. Water that falls on a surface of 6,700 square kilometres contributes to the Salzach river, at the final point it carries some 250 cubic metres of water per second. The Salzach is also a natural border between Salzburg and Bavaria (Germany) for some 60 kilometres. Municipalities that have access to the "Salzburg River" are the following (in order according to the course): Mittersill, Bruck an der Glocknerstraße, Taxenbach, Lend, Schwarzach im Pongau, St. Johann im Pongau, Bischofshofen, Golling an der Salzach, Werfen, Hallein, Puch bei Hallein, Elsbethen, Salzburg City, Freilassing (Bavaria), Laufen and Oberndorf (marking the border between them, the latter one being Austrian), Fridolfing, Ostermiething, Tittmoning, Raitenhaslach and the picturesque town of Burghausen. For many centuries, the Salzach River has been subject to floods, causing severe damages to the city and province. Some of the worst floods occurred 1571, 1789, 1899, 1920 and - most recently and still in the memory of the editorial team of this website - in 2003. The latter flood was only 10 centimetres below the level that would have flooded the historic old town of Salzburg; it was already bad enough to flood wide areas in the city′s residential south. That being said, keep in mind that the "Salzburg River" has been trained since 1820, when first agreements between Austria and Bavaria were signed to build walls for flood protection. Such training has been extended ever since, with growing, but not perfect success. In terms of pollution, the Salzach is doing fairly well: After going through a pretty bad time in the 1970ies mainly due to the paper industries in Hallein, enormous efforts were made to improve the water quality. This was gradually achieved by the construction of more efficient waste water plants and the modernisation of the sewage treatment in Hallein. The "Salzburg River" now meets high standards in accordance with EU legislation. 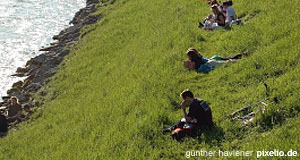 If you want to learn more about the geography and ecology of the Salzach, have a look at the Haus der Natur. This natural history museum of Salzburg has a special exhibition dedicated to the "Salzburg River". For an even more immediate Salzach experience, you should think about cycling along the river. There is a well-developed cycling path starting at the waterfalls of Krimml and going all the way downstream until Passau. The cycling path is called "Tauernradweg" and goes through some of Austria′s most impressive landscape - including some sections of the National Park Hohe Tauern.